15 months ago, The Guardian published a feature story by Matt Seaton about Darlington’s ambitions as a Cycling Demonstration Town. The article was based on a long interview with then Cycling Officer Oli Lougheed. Despite Oli’s apparent chipper attitude to his job, with £1.5m rolling in from Cycling England to spend over 3 years, he moved on to Manchester shortly afterwards. But the article is instructive in laying out both the short-term ideas and long-term ambitions/vision of the local authority. Under the new scheme, Darlington’s transport team plans to put in nine or 10 “radial routes”, running from the periphery right to the centre….The new radial routes will reassign priorities where they intersect the ring road, and will make all the formerly pedestrianised areas dual use. The philosophy here is that cyclists can coexist perfectly safely with walkers, European-style; where it is clear that an area is dual use, cyclists automatically adjust their behaviour, slowing down and riding sensibly….”The object is to create boulevards rather than traffic corridors,” says Tim Crawshaw, the council’s chief designer of the public environment. The hierarchy of road users that transport officers like Lougheed now work to reads as follows: disabled and visually impaired people first, pedestrians next, then cyclists, public transport, delivery vehicles, cars used for business with more than one occupant and, at the bottom of the heap, single-occupancy motorists. As I cycle down a broad residential street with Lougheed, he tells me how a simple measure like taking out the central white line will reduce traffic speeds. Without the sense of a safe, segregated corridor down which they can drive at 35mph, motorists instinctively move towards the middle of the road. But then they become aware of needing to drive more slowly in case they meet a car coming the other way. All of a sudden, they’re driving at 25mph – just because a white line has been taken out. The Cycling Campaign has been doing considerable research on peoples’, and especially motorists’ habits. Yet we see very little sign yet of these being challenged by, for example, reassigned priorities where radial cycle routes intersect the inner ring road. Indeed, the current works behind Marks and Sparks indicate otherwise – cyclists will cross the ring road with pedestrians at a Toucan crossing. *Were they really there in the first place, or was this just media spin? *Will we still get our 10 radial routes, or have some been dropped? *What happens when radial routes hit the inner ring road? 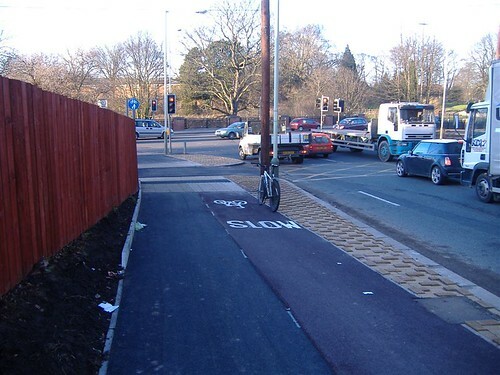 *How does the hierarchy of road users tally with the allocation of road space? These and many other questions should not only be asked of the council. The reason why ambitions change or get dropped is as much through political opposition as lack of political will, and in Darlington there are certainly at least two outside lobbies who are doing everything they can to keep cycling at the very bottom of the hierarchy or road users. But Darlington cannot simply “demonstrate” to the rest of the country what can be done. We also need central government support to get further up that hierarchy. Depressingly predictable, then, that our leaders failed to see the connection between the recent petition to 10 Downing Street (to give cyclists and pedestrians priority over motorists at minor road junctions) and their “new orthodoxy in transport planning”, the hierarchy of road users. RIP Joined Up Thinking. On the Northern Echo forum, news of a cyclist injured on the inner ring road. I am one of the many commuting cyclists who now uses the Inner Ring Road on a daily basis to get to and from work. I didn’t think it was too bad at first but I have had 2 very near misses this week. One of my work colleagues wasn’t so lucky tonight. Broken collarbone, cuts and bruises. And he isn’t a lycra hooligan or a young BMXer tearing up and down the pavements shouting abuse at everyone. He is the sort of person that doesn’t deserve to get knocked off. He rides in a sensible fashion, lights on his bike and a big day-glo safety jacket that you can see half a mile away. We hope the rider makes a quick recovery, and gets back on his bike. In an earlier post’s comments, a reader asked about some paving which had been installed on the new cycle path on the inner ring road, commenting that it looked dangerous. Having not seen the paving, I at first assumed that the commenter meant the tactile paving which is used at the start and end of cycle paths to indicate the nature of the path to visually impaired pedestrians. My wife then mentioned some new paving on the edge of the McMullen Road cycle path which sounded similar and which wasn’t tactile paving, so I went to have a look. 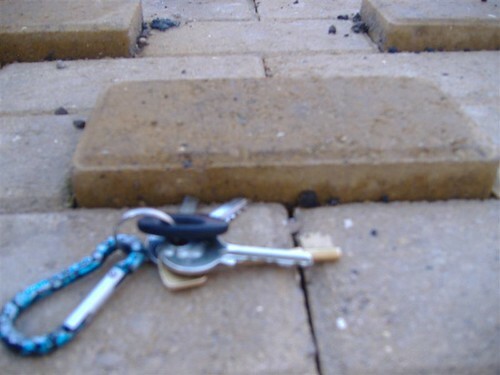 The paving is block paving, with some blocks protruding almost an inch in a staggered pattern. 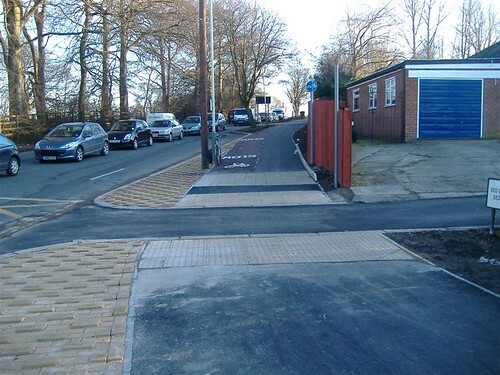 The paving fills the gap between the cycle path and the road, where it moves away from the edge of the road to avoid a telegraph pole. To me, it looks like it is intended to prevent cyclists from attempting to merge with traffic pulling out of McMullen Road and instead to direct them towards using the pavement to either join Haughton Road heading into town, to cross Haughton Road and then proceed along either the road or the Riverside Path, or to cross McMullen Road and use the riverside path towards Mill Lane. However, there are no markings to indicate that this is the case. My advice for anone heading down McMullen Road on the bike path who wishes to join the road traffic on Haughton Road would be to make use of the box junction just visible in the first photo, or the one slightly further up McMullen Road, to access McMullen Road while the traffic is stationary and then to proceed as normal. If you wish to access either of the off-road paths, use the pedesitrian crossings to do so, taking care to avoid other users. It is possible to ride over the paving (I tried) but only at very slow speeds. Not recommended!